These textured beanies make great gifts for both family members and friends. Front post single crochet (FPsc): Insert hook from front around post of next tr from previous rnd, yo and draw up a loop around post, yo and draw through 2 loops. Skip st behind FPsc. (decrease): *Insert hook into next st, yo and draw up a loop. * Repeat from * to * once. Yo and draw through all 3 loops. All sc, tr, and sc2tog throughout are worked in back loop only. Hat is crocheted in spirals from the crown to the brim with RS facing. Do not join at the end of each round. Move stitch marker up each round to mark last st of round. Next Rnd: *2 sc in next st, sc in each of next 4 sts* around. (36 sts) Skip to instructions for working towards brim. Next Rnd: *2 sc in next st, sc in each of next 6 sts* around. (48 sts) Skip to instructions for working towards brim. Rnd 12: *FPsc around next tr from previous rnd, sc in each of next 2 sts* around. Rnd 13: Sc in each st around. Rnd 14: Sc in next st, *tr in next st, sc in each of next 2 sts* around to last 2 sts, tr in next st, sc in next st.
Rnd 15: Sc in next st, *FPsc around next tr from previous rnd, sc in each of next 2 sts* around to last 2 sts, FPsc around next tr from previous rnd, sc in next st.
Rnd 16: Repeat Rnd 13. Rnd 17: *Sc in each of next 2 sts, tr in next st, sc in each of next 2 sts* around. Rnd 18: *Sc in each of next 2 sts, FPsc around next tr from previous rnd* around. Rnd 19: Repeat Rnd 13. Repeat Rnds 11-19 until hat length measures approximately 4”/10 cm (6.5”/16.5 cm, 7”/17.75 cm), ending after Rnd 12, 15, or 18. Final Rnd: Sc in ea st around, sl st to next st, fasten off. With tapestry needle, weave in ends. 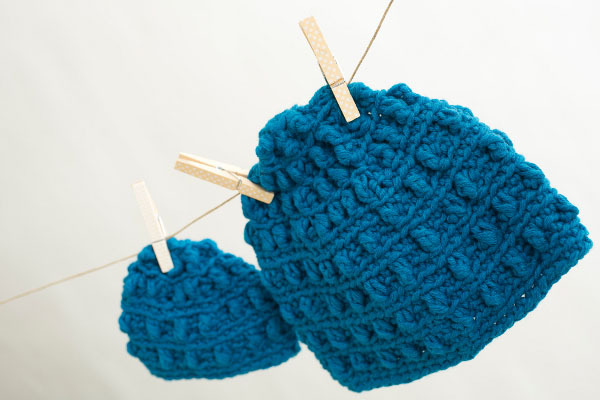 Do you know a mommy and her mini-me that would love these beanies? So glad to have this for the families w/youngsters at Children’s Hospital where I volunteer We’ve been looking for ideas for our volunteers who are shut-ins but crochet. Will share this at our next meeting. My DIL and granddaughter would love these Beanies. I would love a free subscription to this magazine. None of my friends have babies at the moment. Thanks for the free pattern. My niece and great-nephew! And my sister-in-law and her 4 kiddos, and my best friend and her 2 kidlets. And, and, and…. My niece and great niece! Sure do! My daughter and her daughter, my friend’s daughter and her soon-to-be daughter! Oh, how lovely. I love mommy and me patterns. I want to make this for my granddaughter and great granddaughter. Thank you for the pattern. Nope, I’m at the age where all my friends have teenagers! My niece and great-nephew might enjoy this. I actually know TWO future mommy and me recipients. There aren’t many kids in my world right now. But these hats are cute and would make great gifts. My minis and I would love it, but my little cousin and his wife just had their first daughter. She would just love it. I’d bet my niece & great niece would love a matching set! Do i know a mommy and me? not at this moment in time but there is always hope…. My daughter in law and granddaughter. Thanks for these patterns. I don’t know anyone with that small of head to match, but it’s a nice one to adapt if necessary. YES! Both my daudhters/granddaughters and my daughter inlaw/granddaughter!! The obvious gift recipients are my sisters and their three children, but I think they would work especially well for grandmothers and their grandchildren, like my co-worker and her grandson! I know many moms with young kids so I could definitely use this pattern. Would love to make it for our granddaughter Ada & her beautiful mommy, Adellia. I crochet hats for “Knots of Love” and would really appreciate the adult size, also. Thank you for sharing this pattern, I need all sizes! I tried to make this mommy hat but became confused by the pattern. Where does the adult size come in? Thanks for your help. What a great hat set! I’d love to have the adult pattern as well. Thanks! I would like to make the 21″ circumference adult size hat, but I don’t see directions for that one. Thanks! Is this a chunky yarn or worsted weight yarn? Love the pattern! Thank you for the pattern. Merry Christmas to you and yours. Adorable! Sooo thoughtful! Looking forward to making these. Thanks and Merry Christmas and Happy New Years to you and yours. merry Christmas to everyone. Thanks for sharing this pattern. Will try it soon. 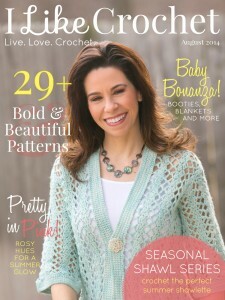 Thank you so much for the pattern looking for the yarn. Thank you & Merry Christmas!! What a wonderful pattern, so very thoughtful. Looking forward to using this hat pattern. Good easy instructions. Thank you so much for the free pattern, I was looking for a hat pattern for my granddaughter and I, so I believe this would be great for the both of us. I love the way the hat is made and directions are really easy as well. Thanks again. Thank you for the beautiful hat pattern. Merry Christmas! Thank you for sharing your gift. I know the Preemies that I crochet for will love the beanie. Assuming a tr is a treble stitch? No guide to abbreviations. Thank you for the free pattern. I’m excited to make these. Thanks for the Beanie pattern. thanks for the free pattern. Thank you for the adorable pattern! Stitch School: Bobble, Puff, or Popcorn? 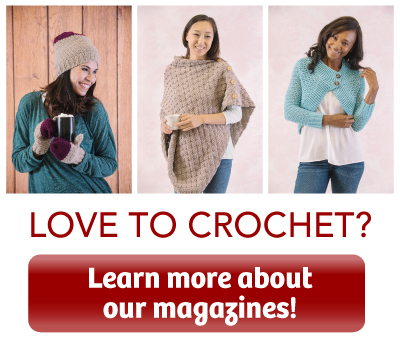 Do you have any tips to speed up crochet?